LAS VEGAS (AP) — The Arizona Coyotes‘ injury-plagued season finally came crashing down in the second period of their 81st game of the season. Arizona entered Thursday night’s game against the Vegas Golden Knights needing a win to stay in playoff contention, but was officially eliminated from the postseason when Colorado went into overtime with Winnipeg earlier in the night. 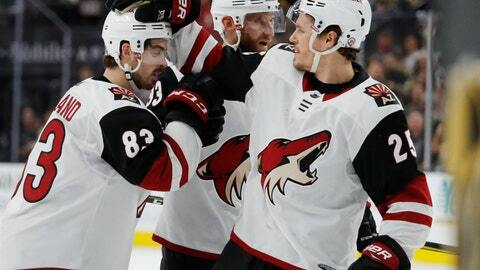 The Avalanche needed just one point to clinch the final spot in the Western Conference, and that ruined a solid performance by the Coyotes, who got two goals from Derek Stepan and 35 saves by Darcy Kuemper in a 4-1 road win over Vegas. It marks the seventh consecutive campaign, and 13th time in the last 16 seasons, the Coyotes will miss the playoffs. The Coyotes lost 377 total man games to injury this season, but never lost their fight in a tight Pacific Division and hotly contested wild-card race in the Western Conference. Since Jan. 6th, the Coyotes are on a 22-13-5 run, while their 16 wins since Feb. 9 are tied for the fifth-most in the NHL. Arizona has earned points in 16 of its last 22 games (13-6-3). The Coyotes, who have earned points in 16 of their last 22 games (13-6-3), improved to 3-3-3 all-time against the Knights, and 3-1-1 at T-Mobile Arena. Richard Panik and Conor Garland also scored for the Coyotes. Kuemper has started a career-high 55 contests and has won a career-best 27 games. Since the calendar flipped to 2019, Darcy Kuemper is 22-9-6 with a 2.02 goals against average. Meanwhile, with Vegas locked into an opening-round series against Pacific Division-rival San Jose, the defending Western Conference champion welcomed back veteran goaltender Marc-Andre Fleury, who had been listed as day-to-day with a lower-body injury. The Golden Knights were 4-3-2 while backup goalie Malcolm Subban stepped in for Fleury, who made 30 stops in his 59th start of the season. Fleury, a three-time Stanley Cup champion, will play in his 13th postseason, and second straight with the Golden Knights. Mark Stone scored Vegas’ lone goal, when Paul Stastny’s takeaway deflection landed on his blade and he beat Kuemper with a backhand for his fifth goal with the Knights and career-high 33rd overall. The lead wouldn’t last long, though, as Panik gathered a loose puck in the slot and blasted a shot past Fleury while falling down to tie it at 1 with 2:37 left in the first period. Stepan’s two second-period goals pushed the Coyotes ahead 3-1. On the first, Lawson Crouse fed Stepan, who deked around Fleury’s right pad to give Arizona a 2-1 lead. Stepan got his 15th goal of the season when he buried a rebound that would get challenged by Vegas coach Gerard Gallant, who was looking for goaltender interference. The Situation Room confirmed the incidental contact between Crouse and Fleury occurred in the white ice and did not constitute goaltender interference. NOTES: After the Golden Knights announced they signed free agent defenseman Jimmy Schuldt to a one-year, entry level contract, the former Hobey Baker Award finalist skated during warmups and was then officially scratched for the game. … Vegas fan favorite Ryan Reaves was also a healthy scratch, missing only his second game of the season. Arizona: Concludes its season hosting Winnipeg on Saturday. Vegas: Finishes the regular season Saturday at Los Angeles.